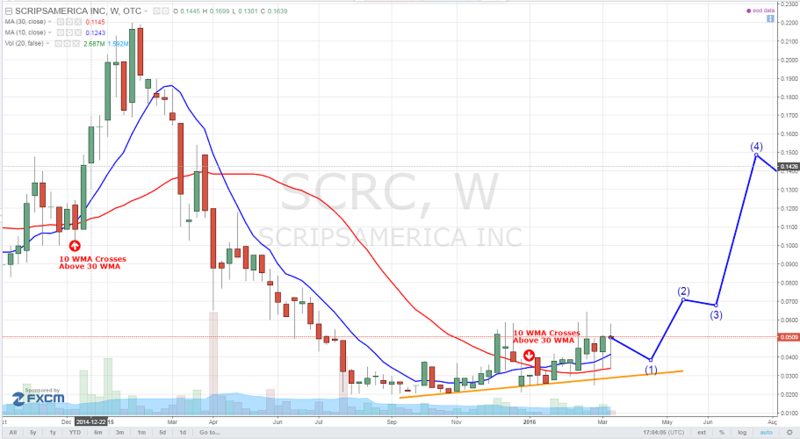 ScripsAmerica, Inc. (OTCMKTS:SCRC) is primed to double, triple or even quadriple from current levels on the surging growth of the company and senior management’s recent commitment to shareholders. SCRC has been steadily gaining investor credibility and building a brand while growing revenues. Next stop for the company is to bring and take the overall financial performance to the next level by growing EBITDA and operating income and eventually net income. It is not hard to see why investors are getting (and should be) excited about SCRC. ScripsAmerica, Inc. (OTCMKTS:SCRC) stock price has collapsed more than 70% since 2015 where it used to trade at $0.22 or 350%+ from current level of $0.048. However, the company is showing signs of turning around and communicating with shareholders its strategic vision and plan. First management has been keen on updating and filing its 10-Ks to increase credibility. It recently posted its 2014 10-K annual report with the SEC. The company is keen on not diluting shareholders any further and will try to find ways around any toxic debt. The company reported revenues of $30.855 million for fiscal year 2014 compared to $0.556 million fiscal year 2013, representing an increase of $30.299 million. Despite the surge in revenues for 2014 relative to 2013, SCRC reported a net loss of $4.747 million. However, net income increased $6.46 million relative to 2013 when the company reported a net loss of $11.213 million. In addition, ScripsAmerica, Inc. (OTCMKTS:SCRC) plans to become current with its 2015 10Q filings. Management stated that they will be filed with the SEC in the next few months. The board and management has been taking steps to boost its credibility and become current with the SEC. Investors should not be surprised if SCRC talks about uplisting to the NASDAQ or other exchange in the future given its revenues and improvements in net income. ScripsAmerica Inc. is a supplier of prescription, OTC and nutraceutical drugs, delivering pharmaceutical products to a wide range of end users across the health care industry. End users include retail pharmacies, hospitals, long-term care facilities and government and home care agencies. SCRC is currently trading at a $7 million market valuation. The stock has broken out of its long-term base and poised for more gains. Management has taken the right steps to clean up its balance sheet, become current with SEC filings, and attempt to reduce dilution to shareholders. Stay tuned as this exciting story is just beginning. We will be updating on SCRC when more details emerge so make sure you are subscribed to Microcapspot so you know what’s going on with SCRC. SCRC was incorporated in the State of Delaware on May 12, 2008. It has three wholly owned subsidiaries, Main Avenue Pharmacy Inc. (“Main Avenue”) a New Jersey corporation formed on January 4, 2011, DispenseDoc Inc. (“DispenseDoc”), a Delaware corporation formed on July 10, 2015, and Pharmacy Administration, Inc. (“Pharmacy Administration”), a Delaware corporation formed on July 21, 2015. It also owns 90% of P.I.M.D. International LLC. (“PIMD”) a Florida Limited Liability Company formed on March 26, 2009. In addition, it incorporated activity from Implex Corporation, which is owned by their legal counsel, a related party, for the first three fiscal quarters of 2014 until we acquired 100% ownership of Main Avenue from Implex. In 2014, approximately 97% of their net revenues were derived from Main Avenue. Since inception in 2008, its business model has evolved significantly. Through March 2013, and to a lesser extent into early 2014, it has primarily provided pharmaceutical distribution services to end users across the health care industry through major pharmaceutical distributors in North America. In 2013, the majority of its revenue came from orders facilitated by McKesson Corporation. However, we had no exclusive contract with McKesson or the other pharmaceutical distributors and margins became compressed. Disclosure: we hold no position in SCRC either long or short at the publication of this article and we have not been compensated for this article.